This photograph was taken in Belfast, Northern Ireland by Queen's Photo Art Co. A Pretty young woman is posed seated in front of a screen decorated in a Japanese style (with blossom and flying Cranes). She is accompanied by her Irish Water Spaniel. The Irish Water Spaniel (I'll call it and IWS for short) is one of the most ancient of the spaniel breeds, originally breed as a wildfowling dog working on the marshes, bogs and estuaries of its native Ireland. In Irish folklore there is a creature called a Dobhar-chú - translated from the Celtic this literally means "water-hound". The IWS as we know it today was developed in the 1830's by Justin McCarthy from Dublin. The breed had its first individual show class at the Birmingham Dog show in 1862. 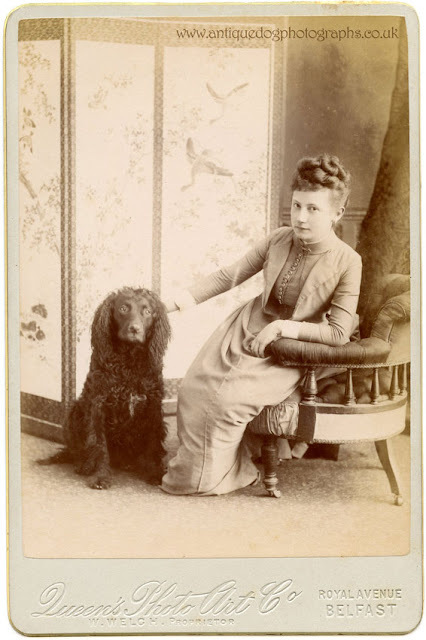 The IWS is perhaps the most distinctive of the spaniel breeds with its topknot of long, loose curls growing down from the head which often covers the eyes; a "beard" growing at the back of the throat often accompanied by "sideburns"; and its curled non-shedding, liver-colored coat. Another unusual feature of the IWS is its "rat tail" which is smooth, apart from its base which has 2-3 inches of curls. You can see this tail on the dog in the photograph if you look carefully. Of the Irish Water Spaniel there are two kinds: the North of Ireland dog, which is given in the annexed engraving; and the South Country water spaniel, of which I have never seen a well-marked specimen. Both are of a liver colour, but the former has often more or less white, while in the latter this is entirely absent. The northern dog is also longer on the legs, with short ears, having little or no feather on them, and both the legs and tail being also almost free from this ornament, and covered instead with a short curly coat, as is also the rest of the body. The southern dog, on the contrary, has long and well-feathered ears, tail round also, and pointed, never being carried above the back; head covered with a perfect top-knot, coming down over the forehead in a peak. These dogs are valued very highly in Ireland, but they are little known out of that country. The northern Irish spaniel is, however, common enough in England and Scotland. 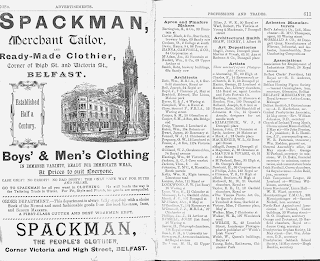 Queen's Photo Art Co. is listed in Street Directories of Belfast, and it would appear that it was in operation between approximately 1890-1900. 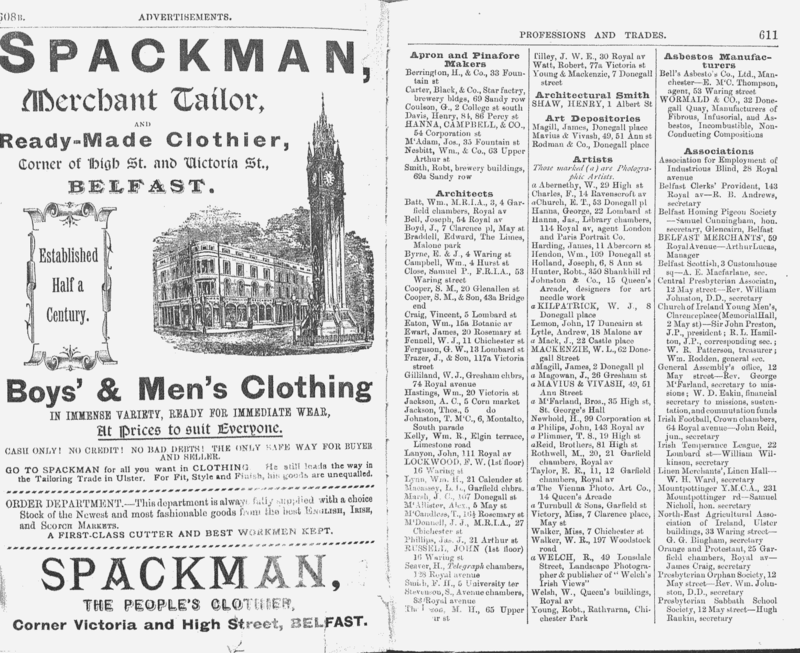 Here is the Studio and the proprietor W. Welch listed in The Belfast And Province Of Ulster Directory 1890, pages 608 - 611. Click on the image for a larger view. 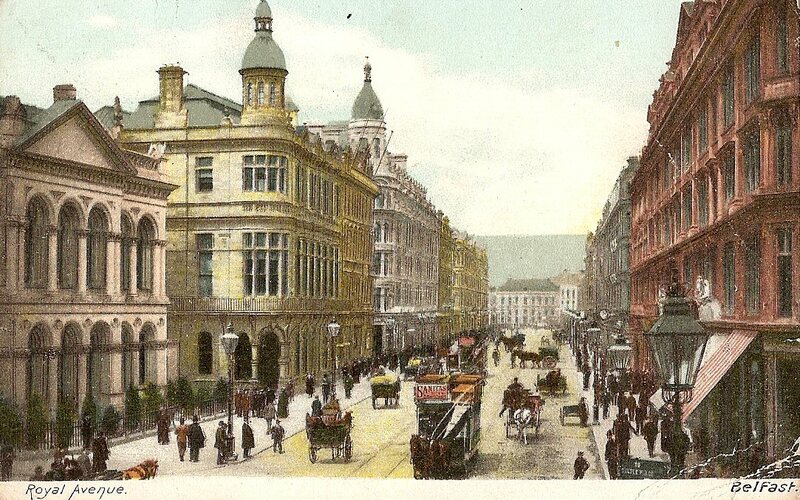 Here is a early 1900's postcard of Royal Avenue, where Queen's Photo Art Co. was situated, click on the image to enlarge. Labels: antique dog photograph, Belfast, Breed : Gundog, Breed : Irish Water Spaniel, Cabinet Card, Dog, dog photographs, Northern Ireland, Photographer : W. Welch, Queen's Photo Art Co.